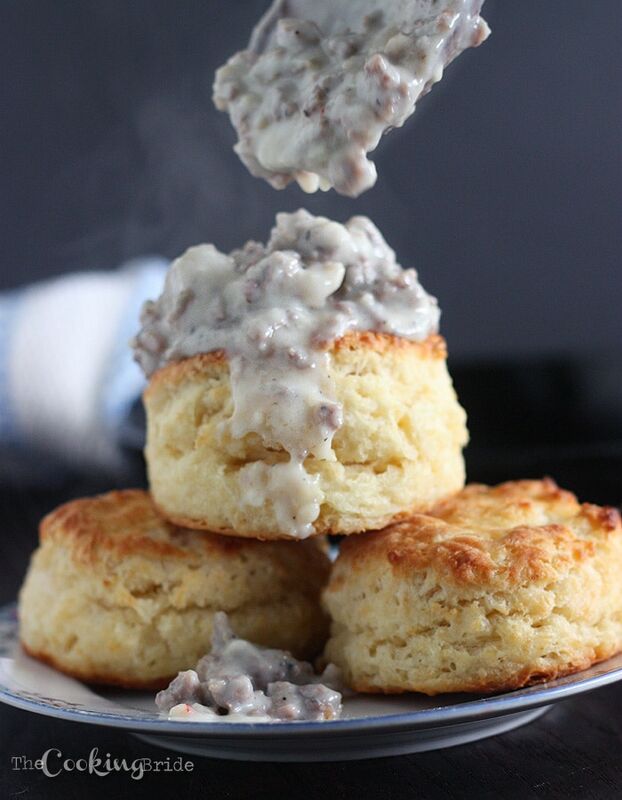 Learn how to make sausage gravy and biscuits in minutes. Simple and easy to prepare, this creamy gravy is a staple in the South. 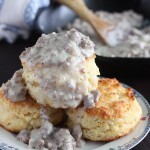 I had planned on doing one post for biscuits and gravy, but as I started writing and noticing my post getting longer and longer, I decided I had better break them down into two. So, if you haven’t read the post on biscuits yet, don’t read anymore. Go here. Then come back. 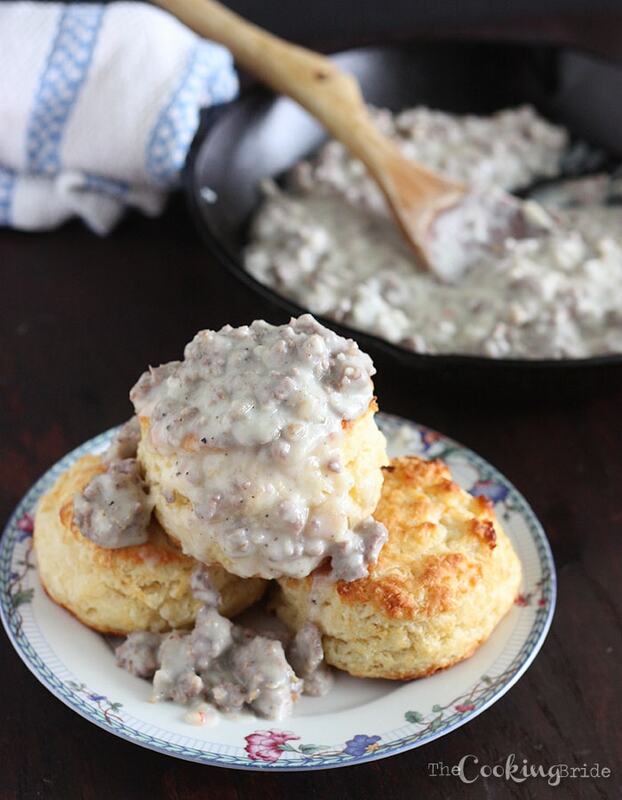 Sausage gravy and biscuits is a staple in the South. Visit any breakfast spot below the Mason-Dixon line and more than likely whatever you order will come with a side of grits and gravy. They go hand-in hand like Fred and Ginger, Batman and Robin, Superman and Lois Lane, R2D2 and C3PO. . .okay, I’ll stop. You get the idea. Since I don’t like condiments with my bread (it’s like putting A-1 on a really expensive steak), it’s not my thing. But The Husband loves it. He gets all dreamy-eyed whenever he talks about how when he was younger his Mamaw used to make biscuits and gravy for breakfast when he went to visit her. A true Southern cook just knows how to make it. It says so in the bible. No, not that Bible. The other one. The one that tells you to wipe your feet before you enter someone’s house and always say, “Yes, ma’am” and “No, ma’am” to any woman in a position of authority or old enough to be your mother. I got tired of The Husband whining complaining that no one made biscuits and gravy for him anymore. If you can master biscuit making, then throwing together a creamy pan of gravy should be no problem. Drippings from a recently fried pan of breakfast sausage or bacon (Hey, I never said this was healthy) are preferred. Be sure to keep an eye on the gravy and stir, stir, stir. Once you add your liquid, it will begin to thicken rapidly. If you timed it right, your biscuits should be ready to come out of the oven just as you finish stirring the gravy. Pile a biscuit or two (or twelve) onto a plate, pour the hot gravy over top, and dig in. Don’t forget to print out my recipe for buttermilk biscuits! Cook sausage in a large skillet over medium heat. Break up sausage into pieces with a spoon and cook until it is no longer pink. Remove sausage from the skillet. Be sure to reserve any leftover grease. Add flour to the grease, one tablespoon at a time. Whisk between each addition to combine with grease and remove lumps. Reduce heat to medium. Gradually add milk, stirring constantly, until mixture begins to thicken to desired consistency. Stir sausage back into the pan. Season gravy with salt and pepper. Makes about two cups of gravy. You’ve reminded me how good this is! I think it will be on the menu here this weekend. Yum…. I like to make enough biscuits to serve one with coffee after the gravy course, with honey butter…. What a perfect breakfast. this looks delightul and a far better offering than i would produce! There are few things I love more than biscuits with crispy edges and soft Middlesbrough soaking up delicious gravy. Then I’m not doing anything the entire rest of the day as I recooperate. There is nothing better than biscuits and gravy! It is by far my favorite breakfast…I’m going to try your recipe! I never cook them on my own…I always order them in restaurants! I don’t like the sawmill gravy. It has a good taste, but it’s too thick for my taste. I want the gravy to cover the biscuit, not just lay inert on top of it. It’s more like a hash. I would never have thought that it was possible to say this, but that looks like it has too much meat in it. Maybe the sausage was really dry and there just wasn’t enough grease to make enough gravy to balance it out? Maybe you thought it would make a better picture this way? Who knows? The recipe was prepared the way MY family enjoys it. If you don’t like that much sausage in your gravy, feel free to adjust the recipe according to YOUR tastes. I keep bacon grease in the fridge just for this kind of thing. There are some recipes where a substitution just won’t work. I haven’t used it in ages though. I’m tempted to do it this weekend. Your biscuits and gravy look wonderful! 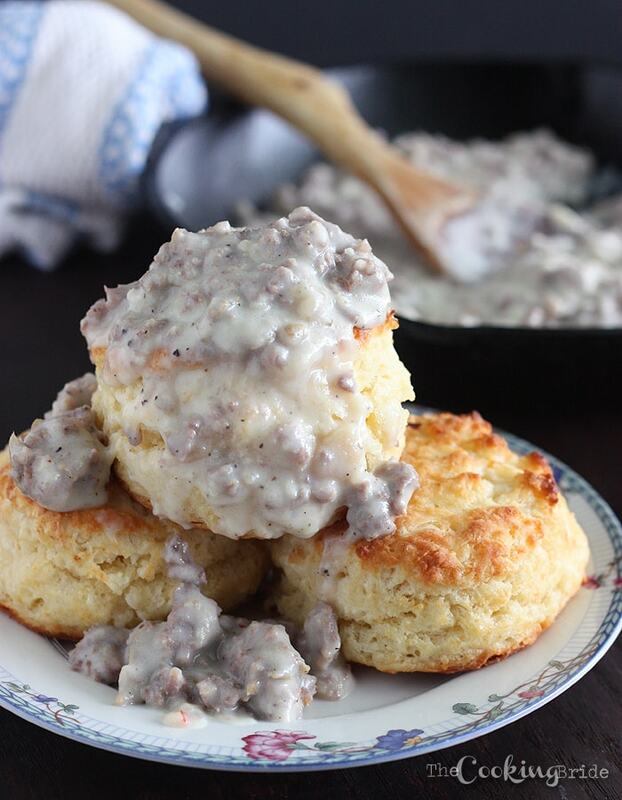 Given that I was born and bred in the north, I’ve never really gotten on the biscuits and gravy bandwagon…but this looks so good that you might just have convinced me to hop on! I am writing a book on American History for my ESL (English as a Second Language) History class. I am including sections on food. I have been searching the web about gravy today. I came across “sawmill gravy” and have read from several web sites. I am very familiar with Southern (U. S. A.) cooking and am a cook myself at times. I like your recipe very much. It is the same as mine but I just call it cream gravy. Everyone I have read is missing something about sawmill gravy. How did the word sawmill get into the name? I know. You have a good cream gravy recipe but you missed the key ingredient to make it “awmill”. My ancestors grew up in the tall timber and were lumberjacks. In a sawmill camp or sawmill town one thing that was missing was milk. No one had time to keep and milk a cow, hence, no milk for the gravy. Then Gail Borden came along with canned condensed milk. If you don’t use diluted canned condensed milk, instead of regular milk in your gravy, it is just white cream gravy. One can put a lot of things in white gravy, including bulk sausage, bacon bits, onions and peppers (hot or mild). The basic recipe for white gravy should not include these things. There should be an add-ons follow-up. Some people quickly whip an egg into their gravy. That is a bad idea. If you put an egg in it, you should have “done gone and made a puddin’ ”; so put some sugar and vanilla extract in too. I have a question? The lumberjacks ate cathead biscuits. Mamma just made very large biscuits (the size of a cat’s head), and called them cathead biscuits. Is that a cathead biscuit? I feel there should be more to it. Cat head biscuits are biscuits baked in an iron skillet. It gives them the shape of a cat’s head. What!! No sausage in it. Thats just Country Gravy. Saw Mill has crumbled sausage in it. I just finished having some 10 minutes ago. I DO LIKE YOUR RECIPES. Please don;t get afinnded. Yep. Sausage drippings, possibly bacon. I simply can’t imagine it made from shortening. I guess I just like the country gravy w/o the sausage in it, and on the side. True sawmill gravy is made with cornmeal, and when it sits and gets thick it looks like sawdust.